Bordeaux winemakers and real estate agents share the same mantra: location, location, location. We couldn’t believe our eyes when wandering through the biodynamic fields at Chateau Haut-Maurac—this is the real deal, pure gravel that feeds the finest wines in the Left Bank. This outstanding estate, just outside the village Saint Yzans de Medoc and overlooking the placid Gironde, sits right on the “croupe de Mazails,” a hilltop that has some of the best drainage in the region. Vines need to breathe, as much as they need to drink—too much water (which Bordeaux and its many rivers have plenty of) and you get flabby, dilute wines. Proprietor Olivier Decelle (the same visionary behind Chateau Jean Faure in St.-Emilion and great Mas Amiel in Perpignan) too is pushing this estate to heights never before seen, replanting vines at a density of 10,000 plants per hectare (higher density puts more stress on vines, lowering yields and thus producing more concentrated, character-rich fruit). Biodynamic viticulture—no pesticides or unnatural chemicals—means this great Graves-like terroir shines through in every bottle. 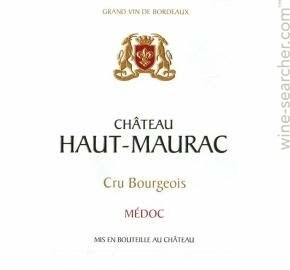 Few “cru bourgeois” estates go to such lengths for quality.